According to the Chinese Zodiac Water Rabbit comes from the 22 January 2023 to 9 February 2024. The sign combines the opposite qualities. Rabbit - a cowardly and timid animal. However, people born in 2023, have a keen intelligence, courage, light-minded. 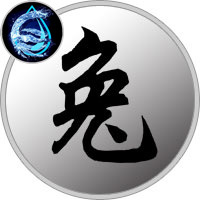 The dominant element - water. The color of the year - Black determining the desire for knowledge. Water Rabbit has an excellent analytical thinking, subtle intuition. Representatives of this sign make a favorable impression. They do not stand alone for long. Laconically, trying to impose their point of view, they prefer to be cautious and secretive. Rabbit can trust completely, he will do everything possible to help. This will not give another’s secret, and would prefer to make a joke in response to intrusive questions. His indecision hides under the mask of imperturbability. In a difficult situation can quickly get together and make a truly heroic act, but it is the exception rather than the rule. Water element endowed Rabbit hypersensitivity, it is easy to outside influence. Often a thoughtful, carefully weighing all the arguments, and only then make conclusions. It has good intuition can predict the further development of the situation. Sometimes excessive meticulousness plays against indecisive Rabbit. However, to steel himself he can not, the nature of this zodiac sign is fully determines its behavior. Water Rabbit is a subtle kind, nostalgic past. This has a sharp mind and an excellent memory. He is fully able to organize their work, but an active business life prefers the quiet life. Of the people of this sign make great professionals: lawyers, managers, office workers, teachers, secretaries. Excessive modesty and intelligence interfere require promotion. They prefer to be satisfied with what they have, although, of course, could qualify for more. Romantic Rabbit believes in love until the end of days, but prefers to get to know your partner and only then begin to act. He never revealed to a man who does not fully trust. Even if in his heart raging storm, he will try to hide the true feelings, as fears that it will reject. After gaining confidence in the mutuality will spare no effort, will delight and pamper half howl all possible means. It seeks to build a home nest, which can feel completely safe. Water Rabbit - balanced, well-mannered, intelligent man. Has broad-minded, able to support any conversation. It prefers shallow chat, but if friends, something really. Needless mistrustful and badly perceives criticism can strike back, but it will take advantage of a good opportunity, and by proxy. He prefers not to enter into open confrontation.